After San Francisco lost to the visiting Los Angeles Rams, 39-10, Sunday afternoon, both Reuben Foster and Adrian Colbert said the same phrase the Philadelphia 76ers spawned throughout recent years: trust the process. 49ers head coach Kyle Shanahan reiterated a similar message during his Monday afternoon press conference. Shanahan does not feel the 49ers’ 1-6 current start to the season affects the long-term goals he and general manager John Lynch foresee. 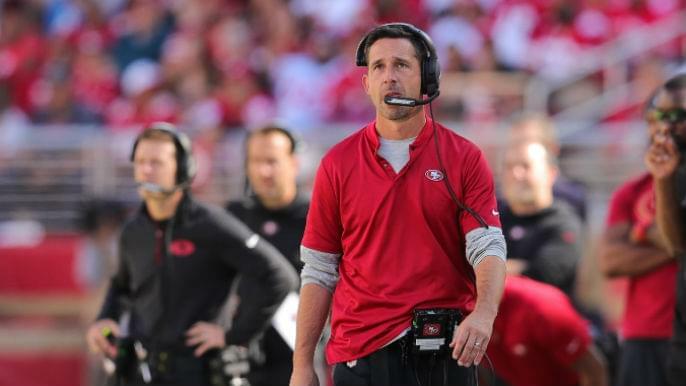 Both Shanahan and Lynch signed six-year deals when they joined the 49ers after the 2016 season concluded. They knew this project would be a rebuild, requiring player overhaul, system overhaul, and a consistent attitude of patience as the process played out. Even when the 49ers started the 2017 season 0-9, the locker room remained tight, something the 49ers coaches and players continue to attest. They maintain the current locker room holds the same optimism. This season, of course, has not gone as expected, but injuries have largely determined that. Jerick McKinnon and Jimmy Garoppolo tore their ACLs either at or near the beginning of the season. The hopes for a memorable 2018 campaign largely rested in the hands of Garoppolo, the 2017 savior and newly minted face of the organization. Since his injury, the 49ers have tailspun. But lost in all the hype surrounding the current season is the fact that just 12 players from the 2016 team remain on the current squad. Lynch and Shanahan have overhauled the roster to tailor it to the current systems being put in place. Even with a promising quarterback, a highly productive free agency period, and seemingly solid draft class this year, the 49ers still appear a season or two away from competing for playoff births. About a week beyond this time a year ago, the 49ers acquired Garoppolo, and everything changed. What the 49ers were able to do — start the season 0-9 and finish it 6-10 — had never been done before in the NFL. Shanahan explained that short-term solutions may not be the best ultimate decisions, even if the Garoppolo template proved otherwise. Shanahan remains confident that the current core is comprised of the necessary personnel to propel the 49ers to their long-term goals.